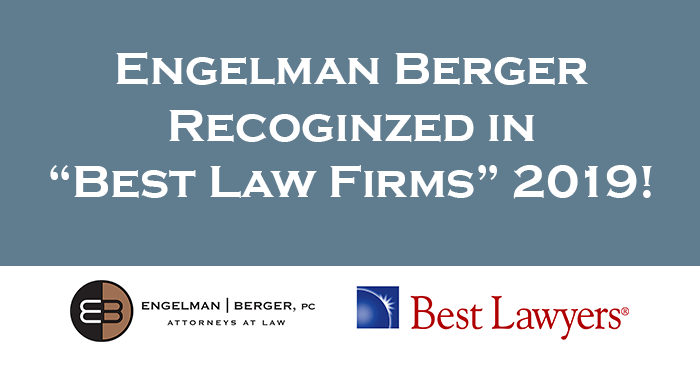 Engelman Berger has been selected for inclusion in the “Best Law Firms” section of Best Lawyers® 2019, considered by many to be the definitive guide to legal excellence. Engelman Berger was chosen in the areas of Bankruptcy and Creditor Debtor Rights, Insolvency and Reorganization Law, Litigation – Bankruptcy, Public Finance Law, and Real Estate Law. Our firm was ranked nationally in one practice area and regionally in four practice areas. Earlier this year, Steve Berger, Brigitte Finley Green, Tami Lewis, and Kurt Peterson were among the individual lawyers selected for inclusion in The Best Lawyers in America 2019®. Best Lawyers® is the oldest and most respected peer review publication in the legal profession. Best Lawyers® selects its honored attorneys and law firms entirely by peer review. Their methodology is designed to gather as accurate of a consensus opinion of the leading attorneys and firms in the profession. Selections are made after compiling data from extensive peer review surveys in which tens of thousands of leading lawyers confidentially review and evaluate their professional peers. Opinions are based on the lawyers’ professional abilities which are compared to others in the same geographical location and legal practice area.